Chhattisgarh Election 2018: The results for Chhattisgarh will be announced alongside that of Mizoram, Madhya Pradesh, Telangana and Rajasthan. 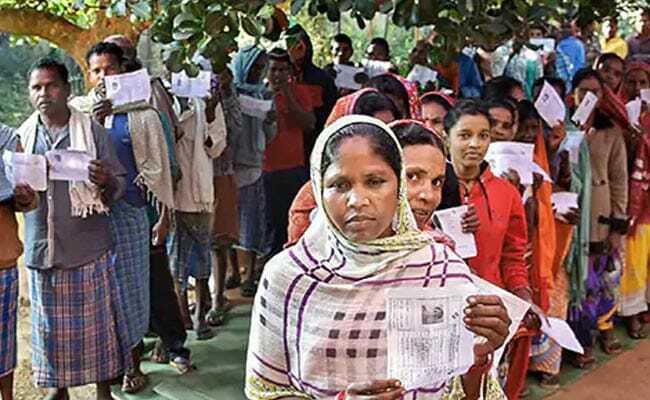 Results for the 90-member assembly elections in Chhattisgarh will be announced today. Voting for the state took place in two phases, one on November 12 and the second phase on November 20. The first phase saw a voter turnout of 76.35 per cent and the second phase - 76.34 per cent. There was an average overall turnout of 76.35 per cent in the state. The results for Chhattisgarh will be announced alongside that of Mizoram, Madhya Pradesh, Telangana and Rajasthan. Chhattisgarh is fighting a three-way battle between the ruling BJP, The Congress and the Ajit Jogi-Mayawati-led alliance. While the BJP eyes a fourth term for the Raman Singh government, an aggregate of 10 exit polls predicted a hung assembly where the BJP, with 41 seats, would fall behind the Congress, which will get 43 seats. Poll's prediction, however, does not give either parties a clear majority. Six of the 10 exit polls expect the BJP to fall short of majority in the 90-member assembly. 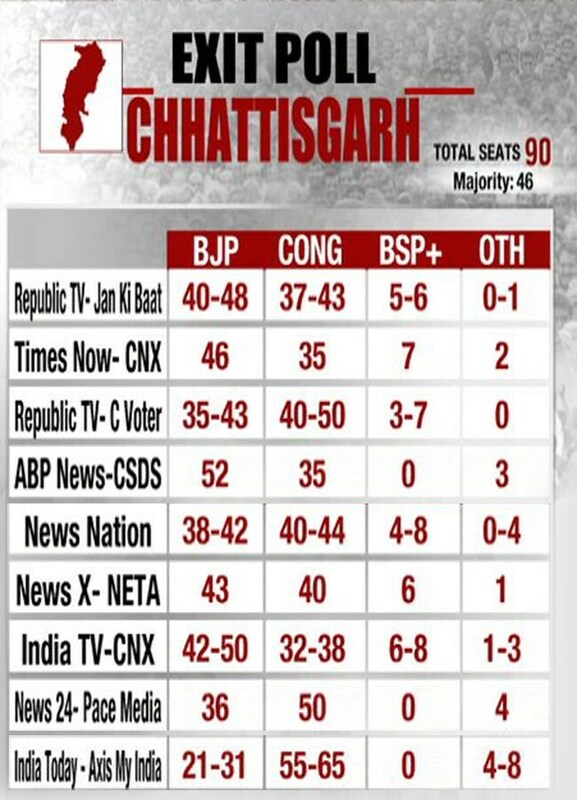 Only two - ABP News-CSDS and Times Now CNX -- have given it a clear majority. 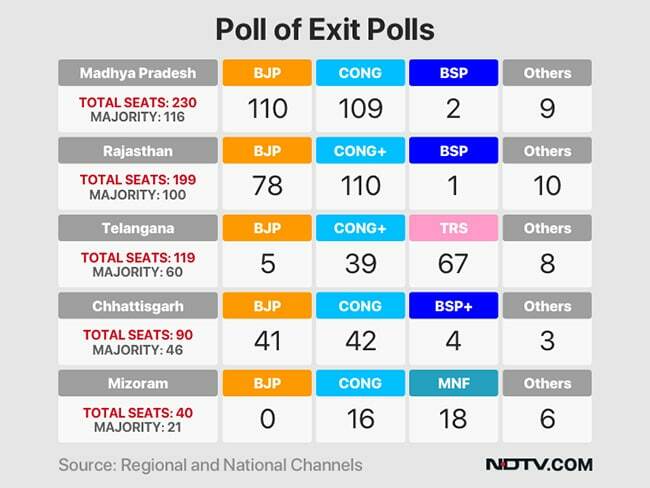 Three exit polls -- by Times Now-Chanakya, News 24-Pace Media and India Today-Axis My India -- have given a clear majority to the Congress. Exit polls, however, are known to get figures wrong. The prospect of a hung verdict gives the Mayawati-Ajit Jogi alliance a crucial role to play in the government formation in the state. Questioned on this eventuality, Ajit Jogi, in a conversation with NDTV's Prannoy Roy said, "In politics you can't rule out anything. So anything can happen". He had however denied to chose a preference. Chief Minister Raman Singh is hoping for a fourth consecutive term in Chhattisgarh and his main opponent is BJP-turned-Congress leader Karuna Shukla, a niece of late Prime Minister Atal Bihari Vajpayee. The state, ahead of polling, saw high-pitched campaigning with Prime Minister Narendra Modi, BJP president Amit Shah and other senior party leaders targeting Congress chief Rahul Gandhi and his family, accusing the opposition party of misleading people during its 50-year rule in the country.